Alfie is a poor boy who one day is chased by bullies into the road and a car comes at him and he breaks time to escape it by time-slipping. Soon after, he takes a trip to a strange company which keeps deeds and money for a long time and he is given the deed to Hexbridge Castle left to him by Orin Hopcraft, a druid who owned the castle. When Alfie moves in he is given a magic talisman and whistle which wake up the magic of the castle. When he arrives, he finds that the castle is a mixture of electricity and magic with a bath which changes the water temperature at your command and light switches which turn on wooden torches on the walls. Alfie and his friends meet Miss Margol and Miss Snitch, the two headmistresses of Alfie’s new school, who want to get in the castle and open a secret door in the cellar. This book is amazing, wonderful and exciting to read! I highly recommend it. 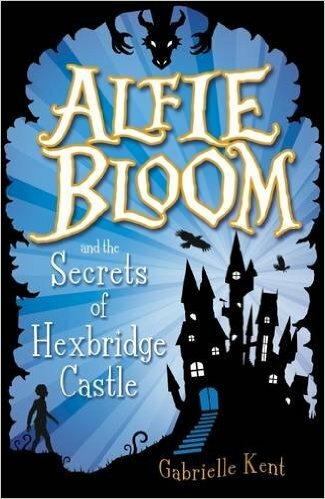 This entry was posted in Book Review and tagged Alfie Bloom, Gabrielle Kent, Hexbridge Castle. Bookmark the permalink.